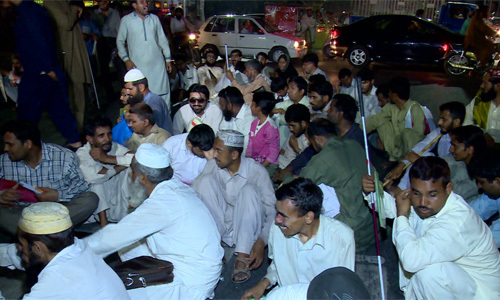 LAHORE (92 News) – Blind people, including children, continued their sit-in for jobs on the Mall Road on Thursday. The protesters said that they did not believe in verbal assurances of the government and will continue their protest till fulfillment of their demands. “We studied wholeheartedly and the rulers should provide us justice,” they said. The protesters from all over the province spent the night on the road. A few of them passed their time by singing songs and reciting poetry.